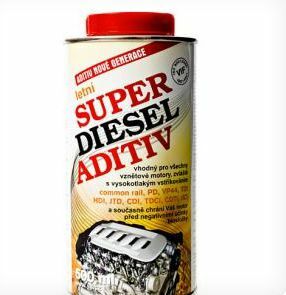 Our offer contains additives for SUPER DIESEL ADITIV in summer design. The summer admixture for diesel improves combustion due to the increased cetane number. Other benefits of the multifunctional additive include engine noise reduction, anti-corrosion effects, and maintenance of injector cleanliness. The summer additive saves the fuel pump by suppressing fuel fouling throughout the fuel system. The diesel additive in the summer version reliably protects your engine.